A good, reasonably powerful general purpose sander. The Rockwell's 7.2AMP motor can handle most things, and, as it comes in its own case, it would make an ideal gift for the carpentry enthusiast in your life. The inclusion of a case also makes it a potential choice for handymen, as it means the sander doesn't have to take up space in a tool box, and can be safely stowed separately in the back of a truck or works van. Predominantly aimed at individuals looking for a reliable, affordable belt sander for general purpose home DIY, the Rockwell might also suit janitorial staff and custodians whose jobs include minor repairs. 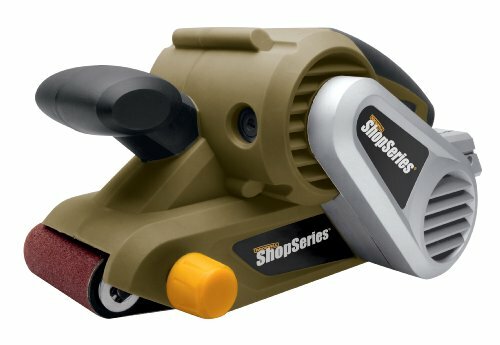 The SS4300K may not be a high-end, professional machine, but it’s more than a simple DIY home tool. Besides, it doesn’t cost nearly as much as belt sanders with similar features. While it looks bulky, the Rockwell is actually relatively light, and designed to be easy-to-use, and readily understood by someone without any background in carpentry or power tools. The dual handle is arguably the highlight of this model, at least when it comes to design – it guarantees a softer grip and improved comfort. The Rockwell offers a lot of bang for your buck, providing strong, consistent power on almost any job. This sander does run very loud, so, if you don't have ear defenders already – buy some along with the Rockwell. You'll need them! The Rockwell brand doesn't seem to have the same cachet that it used to. They seem to ship a fair few defective units - though their customer support does good work. If you're looking for a good general purpose or light professional use belt sander, at a good price, then you could definitely do worse than the Rockwell SS4300K. With the power to tackle most every day jobs, the price is unlikely to put anyone off. However, spending a bit more will get you a lot more.